A puzzling publishing murder attracts the eye of Ellery Queen. Mandarin Press is a premier publishing house for foreign literature, but to those at the top of this enterprise, there is little more beautiful than a rare stamp. As Donald Kirk, publisher and philatelist, prepares his office for a banquet, an unfamiliar man comes to call. No one recognizes him, but Kirk’s staff is used to strange characters visiting their boss, so Kirk’s secretary asks him to wait in the anteroom. Within an hour, the mysterious visitor is dead on the floor, head bashed in with a fireplace poker, and everything in the anteroom has been quite literally turned upside down. The rug is backwards; the furniture is backwards; even the dead man’s clothes have been put on front-to-back. 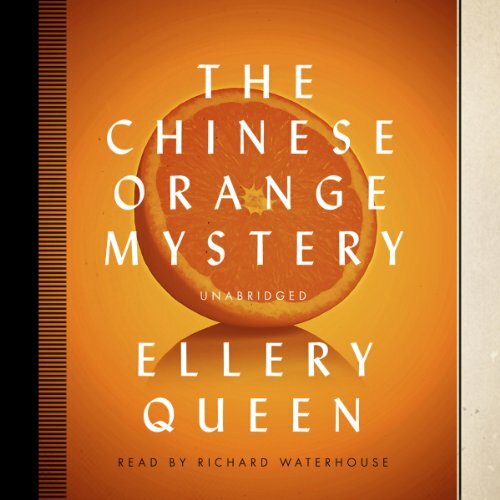 As debonair detective Ellery Queen pries into the secrets of Mandarin Press, every clue he finds is topsy-turvy. The great sleuth must tread lightly, for walking backwards is a surefire way to step off a cliff. As most people who read detective stories and mysteries know, the Ellery Queen novels are splendid examples of their time and of the locked room/impossible crime genre. This book is no exception. But be forewarned: the narrator leaves everything to be desired. he is stiff, awkward, artificial. His attempts at characterization through accents are laughable. He makes listening a continuous challenge. To me, he reads the book as if he were reading it to a group of beginning English-language learners, who were following along with the printed text. I had to watch this on a minimum of 1.25x to prevent my mind from wandering off mid-sentence as the poor reader inched his way through syllables like a drugged sloth. I put up with the resultant squeakiness, but it was decidedly sub-optimal. Bit of a shame, as this is an entertaining mystery.